A tropical destination wedding may seem dreamy, but taking off for a sandy land far from home could burst the bubble on other wedding day desires. Say “bon voyage” to the big wedding (event and lodging space may be limited), “sayonara” to being surrounded by all your loved ones (not everyone will have the budget to travel), and “adios” to being alone on your honeymoon (some guests might choose to stick around and soak up some sun—that is, in the beach chair next to you and your new spouse). The good news is you can have the best of both worlds by simply incorporating a theme of your favorite tropical destination into your close-to-home wedding venue. 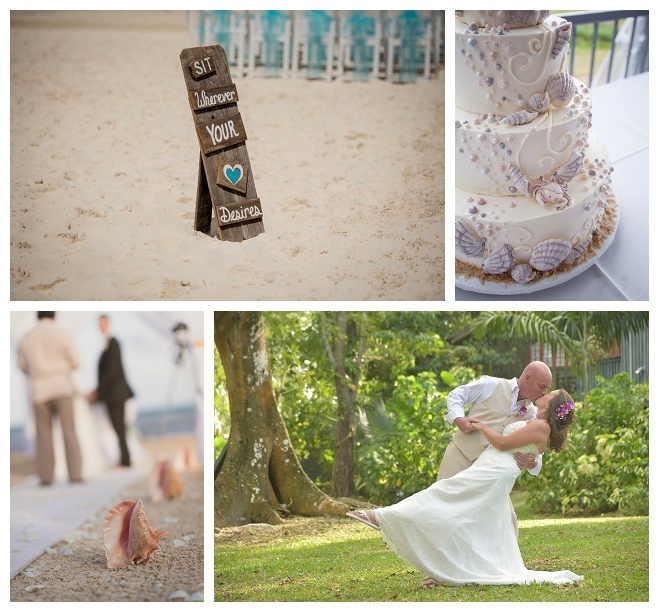 Not sure what beachy destination is best to represent on your big day? You could scour Pinterest and Instagram for inspiration, but why not draw upon your own experiences as a couple instead. 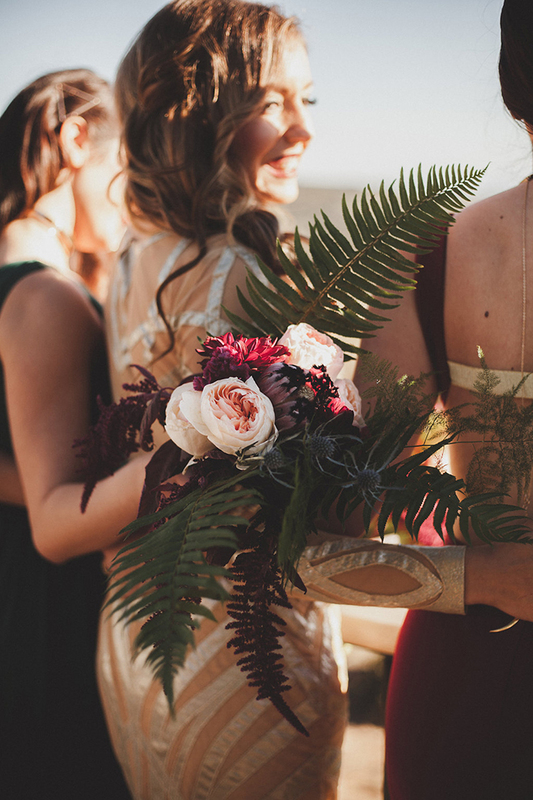 If you’ve traveled together and have fond memories or fun souvenirs from a favorite location, work those into your wedding day details. If you’ve yet to jet set to someplace tropical, how about a pre-wedding weekend getaway? For example, despite the longtime tan-line stripe on my left ring finger, on a recent trip to Sunset at the Palms in Negril, Jamaica, the romantic treehouse-style bungalows and lush and vibrant foliage of the all-inclusive hotel’s grounds had me convinced my husband and I needed to do a tropical wedding vow renewal. Book a quick trip and you could come back with a bevy of bridal ideas! 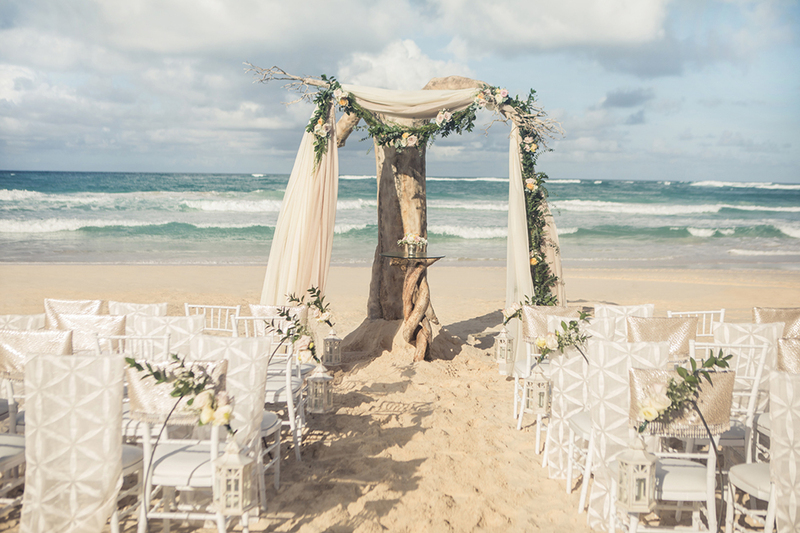 You may not be able to replicate the sun, sand, and crashing ocean waves at a city, country, or small town wedding locale, but don’t overlook the transformation Mother Nature can make. If you’re seeking something sophisticated, take advantage of the many orchids Jamaica and other tropical locations have to offer. Wyndrum recommends pairing white Cymbidium Orchids and Stephanotis with larger tropical leaves, such as Tepee or Ti for an elevated elegant look. Use scattered palm leaves in lieu of a runner or rose petals, or line either side of the aisle with woven baskets filled with tropical blooms. Swap out your standard place setting with a decorative leaf, using white or metallic calligraphy to showcase your guests name. Oversized leaves can also double as signs to welcome your guests, list the menu, or display table numbers. Skip the blooms and let greens steal the scene. Big leaves, like Galax and Monstera, look great in glass vases, as do taller fronds, such as Sword Fern and Sago Palm. Varying shades of green with a bright white set a beautiful scene for for a more monochromatic marriage look. But to go totally tropical, use hues! “Fuchsia, orange, coral, yellow, and bright green are colors that complement tropical themes,” says Bron Hansboro of The Flower Guy Bron. If so much vibrant color feels too over the top, Bron suggests taking a more modern approach by mixing in metallic tones of gold and silver, which can quickly add a luxe feel to any design. 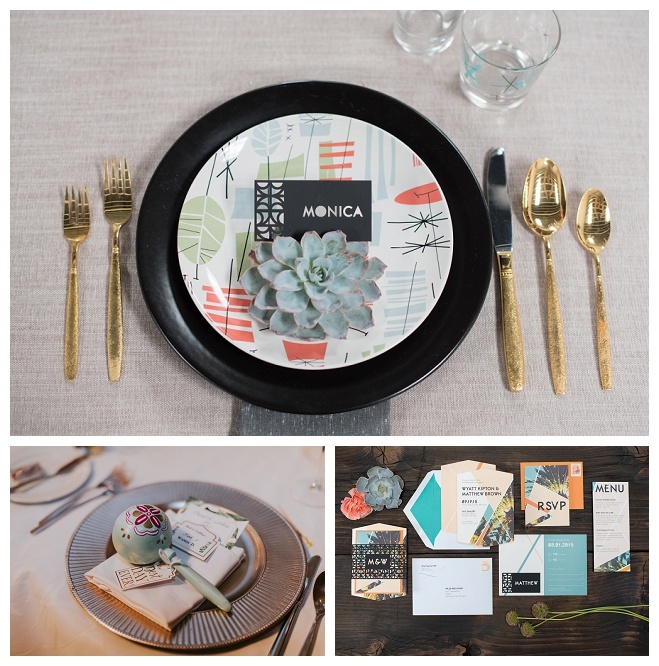 Place settings: Ditch all white dishes and add a touch of whimsy and pop of color with patterned plates and glassware. Favors: Let kitschy souvenirs inspire your favors while also boosting your color story and tropical theme. Paper trail: Paint the picture with colorful invitations that are used on your wedding day for programs, menus, and other print pieces. 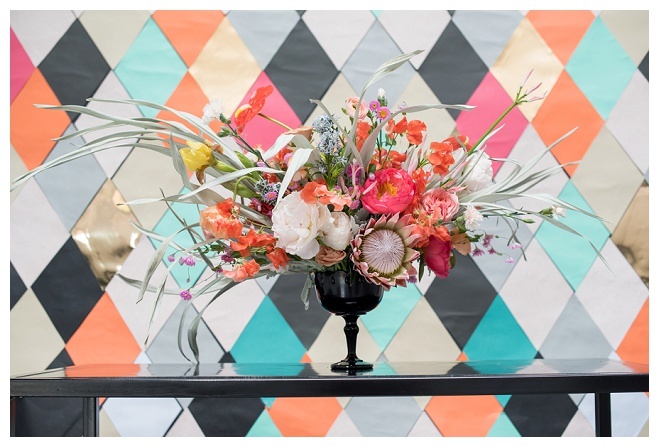 Head to any party store, and you’ll soon see how a tropical theme can feel chintzy fast. Less is more when it comes to keeping your wedding more tasteful than tacky. Photography by Mikkel Paige Photography; design by Color Pop Events; cake by Lael Cakes (left); Photography by RS Weddings; florals by The Flower Guy Bron (right). 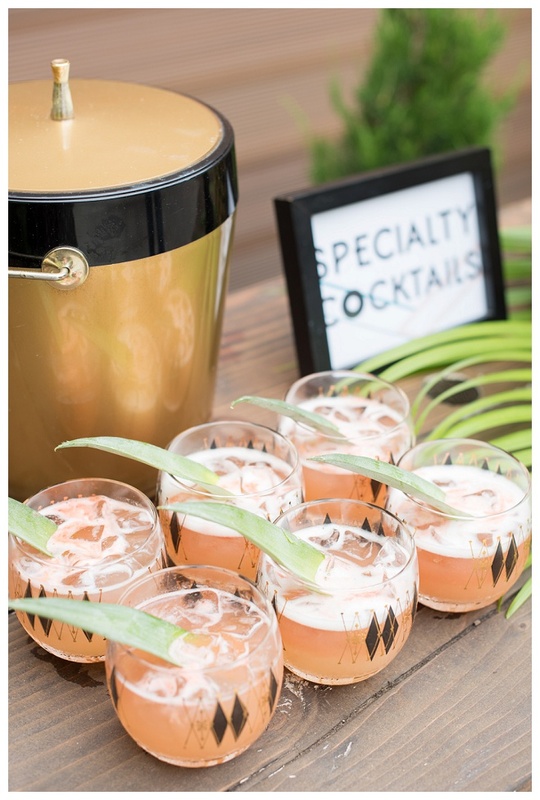 “Incorporate more subtle details to contribute to the aesthetic without being too in-your-face,” says Weinberg, who gives suggests setting a tropical tone of pineapples in various forms—real, miniature, copper. Seashells: Whether you pick them up on the beach or at your local craft store, seashells can add dimension and delicate color with sophisticated style. Sandals: Encourage guests to kick off their shoes and slip into favors of his and her flip-flops when it comes time to bust a move on the dance floor. Signage: Use driftwood combined with pops of tropical color to create signage for ceremony and reception seating. Treat your guest to the tastes of the tropics with flavors not always familiar on the mainland. 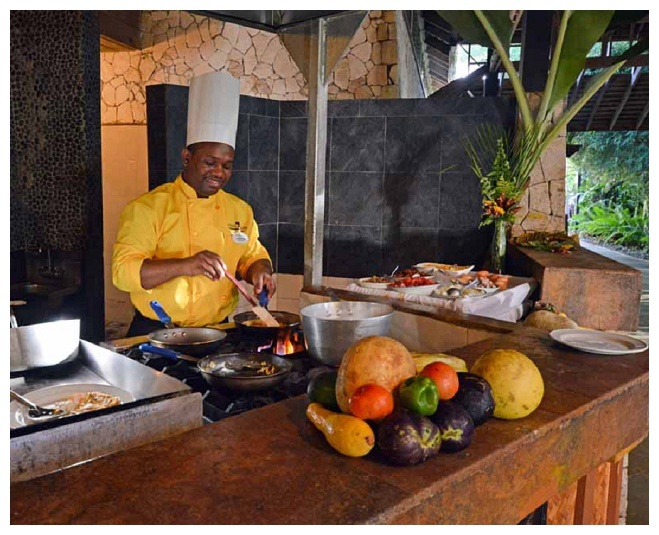 Take a page from the Sunset at the Palms servings, where local cuisine includes flavorful fare of jerk seasoning, fresh seafood, curry spices, coconut, rice and beans, and fresh fruit aplenty. But definitely don’t forget to pair the fare with tasty adult beverages. After all, island time is all about feeling fine...or “irie” as the Jamaicans might say. Take your inspiration from the ocean with a coral and aqua palette, for a bohemian beach wedding that’s equally at home on a Wisconsin lake.